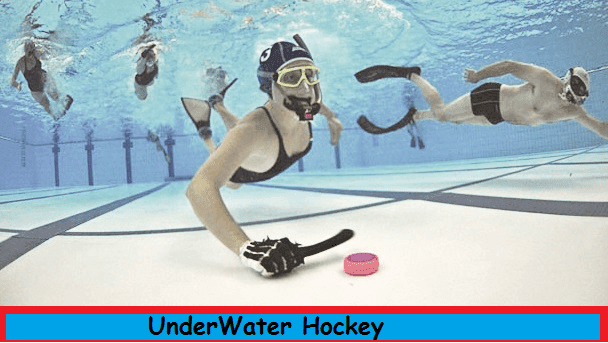 We will learn about the sport of Underwater Hockey today. However, some context is needed as to what it is, its similarity to regular hockey, what are its rules, who plays it and so on and so forth. Before we get into the Cliffs Notes of it all, some context is needed. Let’s begin with some hot news in this niche sports world. Looking back at our calendars, July 7 had us all waiting eagerly for the latest Spiderman movie release. Or did you have other plans? For a lot of people, that week was all about the anticipation, for others, not so much and looking back on it, it kind of shows on its lifetime box office. 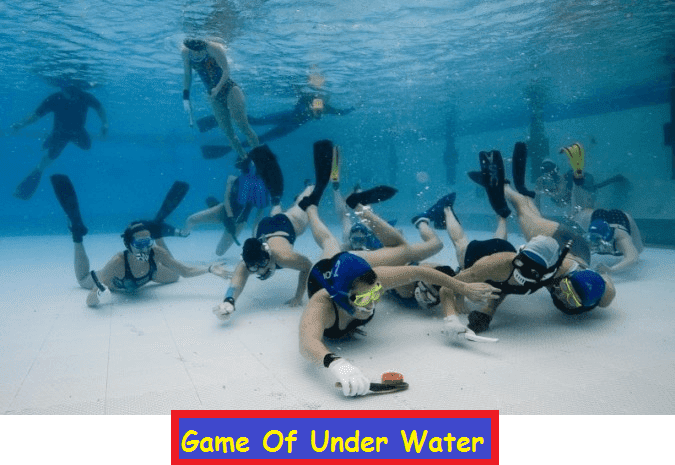 However, just two days before, an audience of sports enthusiasts occupying the common area between the aquatic and hockey Venn diagram found their hearts crying out for the Columbian Underwater Hockey Players whose travel funds were robbed. While it’s no Bruce Wayne or Peter Parker dramatic run-in with a robber, it has two pros running in support: it’s real and has a positive climax at the end. To cut it short, since there’s detectably low interest in the Columbian underwater sports activity struggle, a successful fundraising took place and allowed the team to participate in the Underwater Hockey Age Group Champions at Hobart, Australia. That’s not it, of course. One can’t just casually mention a piece of scandalous trivia from this sport and not introduce the sport in any way. While it won’t be encyclopedic, there’s enough to want to make a team and go down to your local pool for a quick game of Underwater Hockey. Who knows, maybe there’s a world champ in you!! Yes it is and it looks something like this. Here we go. To say the least, this sport didn’t sprout about out of boredom and trying to make your lazy and clearly sportsmanship devoid self feel relevant and thus formulate something from thin air, like, I don’t know, golf! No, it’s a real sport with a practical and necessary history. You May Also Like > Favorites Sports Of Some Country. Trust me, this is no ordinary sleep inducing history lesson. Unlike others, it’s actually kind of cool and refreshing to know about. The 50s’ and 60s’ weren’t easy times for people. Cold War and constant threat of nuclear war in the air made it an absolute point of survival that one think out of the box to remain strong and invincible. According to the history books, this strange rendition of an otherwise regular sport came from the British, the nation equivalent of the expression been there, done that. They are the firsts and the trailblazers at so many things in our lives today. It has been made clear that the British Navy, in the 1950s, came up with the sport to push their divers’ capabilities to the max so that they can do real-life activities out of the underwater scene in Tom Cruise’s Mission: Impossible – Rogue Nation where he had to hold his breath for reportedly 6 minutes in some underwater death tank . Now that’s the on-record information, for all we know, sailors got bored and came up with the sport as recreation. It did not stop there of course. The game evolved and is now played in 20 countries across the Globe. 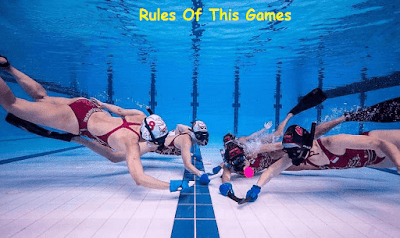 For the curious ones out there wondering about the dimensions of the sport and how accurate it is to, well, the regular land one, this sport takes place underwater in a pool that is 25m by 15m in size and has to hold water from 2m to up to 4m in depth. Those who are interested can join the game and work their way upwards. It begins at the club level. Meaning, a local level which then selects talent for the national team and sends them on their way to the World Cup whereby you’re robbed of your travel funds. Moreover, for the youngsters, they can hone their skills in the under 19 challenges before stepping up their game for men’s, women’s, and masters team, as they grow older. As far as time rules are concerned, relating to the regular hockey, underwater hockey consists of each game having 15 minute halves with half times running up to 3 minutes. Of course, they have half times, they’re not savages, please. Therefore per each half, a team is instructed to have a one minute time out. Rules aren’t too lax with the players required to be alert on the last two minutes since it risks stoppage in the event of any smarty pants hanky-panky. What? I’m appealing to the general sports enthusiasts, give me a break! Let’s look at the team configuration: 12 players, 10 fixed to play, out of which 6 are fighting it out in the pool while 4 wait as extra substitutes. They look like fish, all of them, and rightfully so. Fins, masks, snorkel, gloves and it’ll never stop to look normal for a second. There are 2 referees in the pool and one outside. Now, the item of attraction is the 1.5 kg puck and since we’re talking water and not air, something suitable to the change in density that plays seamlessly is of paramount concern. Don’t worry, it’s been figured out. The puck is covered with a plastic layer and inside it has got lead, so be sure to hide your magnets from the refs for easy play. A lot to keep in mind, right? Here’s a quick recap. Teams wait by the wall, with the hand touching the pool wall while the puck sits unsuspectingly in the middle of the pool. As soon as the ref sounds the alarm, or the buzzer or a gun depending on the gun laws in your country, as you guessed, the players rush to get to the puck with more fervor than the Bangladeshi Cricket team’s desire of competency in modern cricket as it fights to come out of the ashes of irrelevancy. There are 3m deep goal trays at both ends in the pool to score points, or in the actual vernacular, goals. All teams like battle field analogies and set ups. I’m guess they’re not too far off from the Trojan War. If by Trojan War, you mean Achilles’ formation of 3 forwards, a strike, 2 wings, 3 backs, 2 half backs and a full back, then yes, that is accurate. While Achilles was dunked only for awhile, here, holding your breath underwater and how long you do it are essential since you can’t waste precious time trying to reach for air while your team below suffers goal after goal. In many ways, it’s a gentleman’s sport one that would bore the God Poseidon to death. Here, the rules of ice hockey, or lack thereof, do not apply. No contact, hitting or holding the puck in your hand, placing it on your bat or hiding it from view under your foot. None of that are allowed. For fouls, a free puck is presented which gives a 3m advantage or there’s another option to utilize one or more players until the match ends. Further to that a foul can then extend to a penalty 2 on 1 or a goal shot. There is no greater result from exercise or physical activity than that found in aquatic sports. Besides its strengthening and therapeutic aspects, water sports have always been a thrill. Access to water based sports maybe be limited to the masses around the around, but if you’re someone who can try it, then try it out. You’re underwater, you’ve got to push your body extra hard to play a sport that’s already demanding on the ground, so you know when you get out, you can proudly say your body performs at an elite level. Also, it’s fun. In an age where concussion filled American football and physically vicious MMA makes one stand out, this almost fringe sport could be the refreshing change we need in an aggressively anxiety causing world.